Sea Glasbruk was founded in Sweden in 1956, and is still in production today. Designers as the factory include Goran Anneborg, Lena Engman, Bjorn Ramel, Renate Stock and Rune Strand. Sea Glasbruk is now part of Orrefors Kosta Boda. Sea Glasbruk smokey Swedish cased glass "rocket" vase, designed by Inge Samuelsson. Ref: Scandinavian Glass Smoke and Ice p28. Sea Glasbruk blue Swedish cased glass "rocket" vase, designed by Inge Samuelsson. Ref: Scandinavian Glass Smoke and Ice p28. Sea Glasbruk turquoise Swedish cased glass "rocket" vase, designed by Inge Samuelsson. Ref: Scandinavian Glass Smoke and Ice p28. Sea Glasbruk green Swedish cased glass "rocket" vase, designed by Inge Samuelsson. Ref: Scandinavian Glass Smoke and Ice p28. Sea Glasbruk smokey Swedish cased glass vase with small glass particle rings, probably designed by Rune Strand. Ref: Scandinavian Glass Smoke and Ice p56. 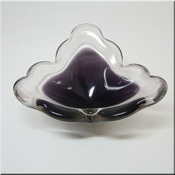 Sea Glasbruk purple + white Swedish cased glass bowl, in the style of a Flygsfors "coquille" bowl, signed to base. Sea Glasbruk Swedish hooped purple + clear cased glass vase, labelled. Sea Glasbruk Swedish hooped blue + green cased glass vase. A very similar design was made by Aseda Glasbruk. 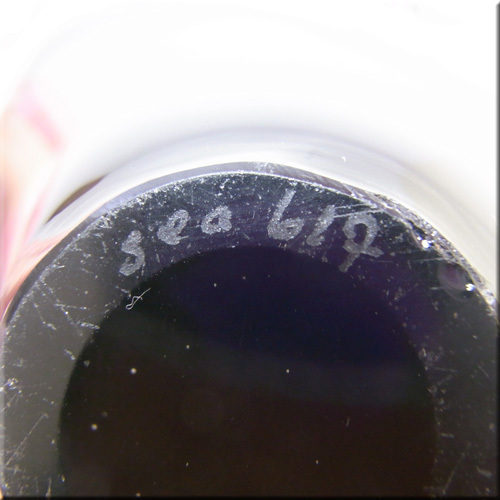 Sea Glasbruk Swedish hooped purple + clear cased glass vase, labelled. Sea Glasbruk Swedish hooped red + clear cased glass vase. A very similar design was made by Aseda Glasbruk. Sea Glasbruk Swedish hooped red + clear cased glass vase. Sea Glasbruk Swedish hooped green + amber cased glass vase. 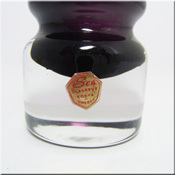 Sea Glasbruk purple Swedish cased glass vase, labelled. 2 Sea Glasbruk purple Swedish cased glass vases. 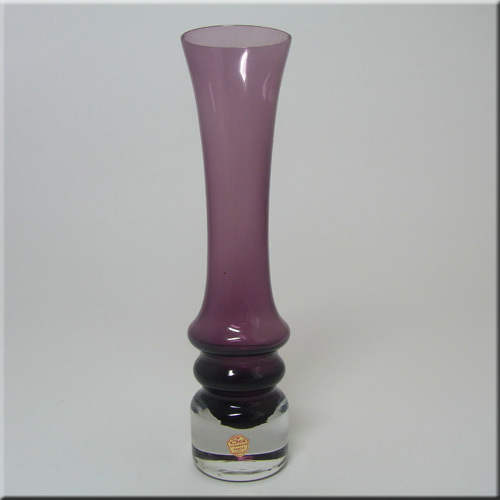 Sea Glasbruk purple Swedish cased glass vase. Sea Glasbruk green Swedish cased glass vase. Sea Glasbruk blue Swedish cased glass vase. Sea Glasbruk green Swedish cased glass vase. Sea Glasbruk amber Swedish cased glass vase. Sea Glasbruk Swedish hooped orange + clear cased glass vase, with George Hardy import label. A very similar design was made by Aseda Glasbruk. 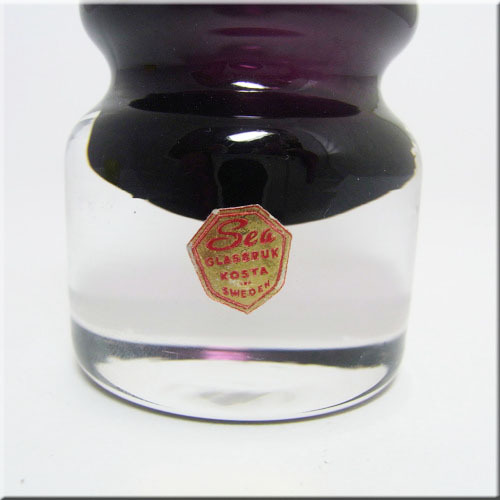 Sea Glasbruk Swedish knobbly purple + clear cased glass vase, labelled. Sea Glasbruk Swedish knobbly purple + clear cased glass vase, labelled. 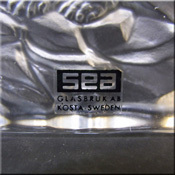 Sea Glasbruk Swedish smokey cased glass vase, labelled. Sea Glasbruk fawn paperweight with label. Sea Glasbruk polar bears paperweight with label. Sea Glasbruk Swedish hooped blue + clear cased glass vase. Sea Glasbruk Swedish purple + clear cased glass vase.